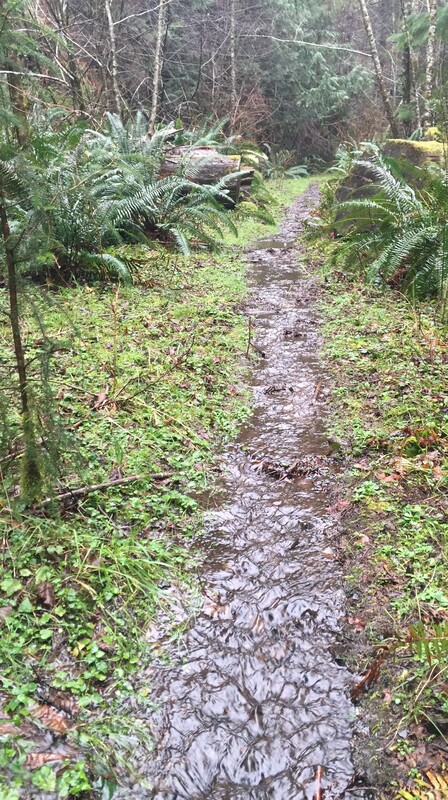 Cummins Creek Trail on Jan. 23, 2016, (left) and on Feb. 14. A little rain turns the trail into a shallow creek. It’s amazing the difference a little rain will make on an Oregon coastal trail. I made my second visit to the Cummins Creek Trail in the Cape Perpetua Scenic Area in the past month (the first run can be found here). I had planned a different trail run for Sunday, but there was a fairly steady rain overnight — nothing heavy, just the typical Coastal Oregon rain. And since it was still raining in the morning, I decided to revisit a trail I did know rather than risk a trail I didn’t know. The narrow, rocky single-track near the highpoint of the Cummins Creek Trail was running with water on Feb. 14, 2016. It misted or sprinkled on me throughout the run, but for the first hour or so, the trails didn’t really show any negative effects. Under the towering pines, the forest floor was needle-covered and soft. In flatter areas, the water accumulated in a series of small puddles. But in the steeper sections, the elevation change resulted in water running down the middle of the narrow, rocky, single-track trail. In fact, one area (shown in the photo above) had turned from a rocky trail in January to a shallow, rocky stream in February. Faced with a 20-yard stretch of rushing water, I wasn’t sure how I’d get down the trail and stay dry. But I found a nearby branch — like a walking stick — and I thought I could pick my way across the high spots. And that worked for about two steps, until the branch shattered, plunging me into the running water. Oh, well. If you’re worried about getting wet, you’re in the wrong place. I’m learning more about the navigational abilities of my Suunto Ambit2. If you can find GPX versions of your trails, you can download those onto the watch, and let it guide you. TrimbleOutdoors has been a good source of GPX files; I had to sign up for a trial membership to download a few, and I haven’t yet decided that I want to pay the $30 annual membership. AllTrails.com might be another good source, but it, too, has a membership fee.